for $419,950 with 3 bedrooms and 2 full baths, 2 half baths. This home was built in 2003 on a lot size of 1.1600 Acre(s). 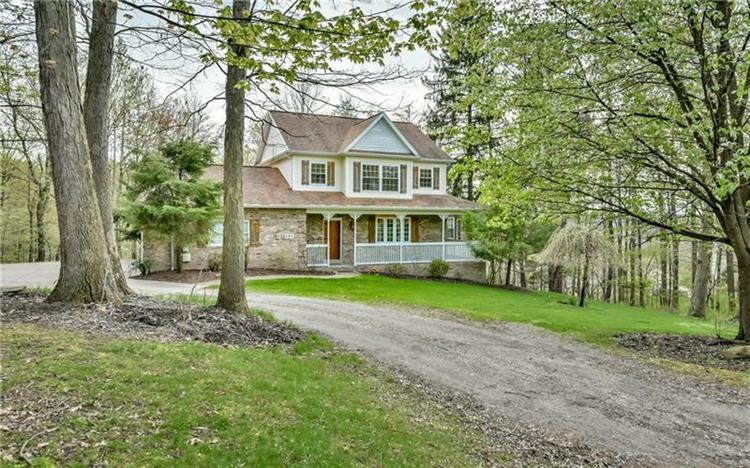 Custom built home in private setting on a 1.16 acre lot in the desirable neighborhood of Madison Woods. Gleaming hardwood flooring in living room. Cozy stone two sided fireplace in living room & kitchen. Nice sized eat in kitchen w/ built in oven, gas cook top in center island & large breakfast bar seating area. Sliding glass door from kitchen opens to oversized deck overlooking private wooded back yard. Huge first floor master bedroom w/ vaulted ceiling, large walk in closet, on suite master bathroom w/ jet tub, double bowl vanity & step in shower. Laundry conveniently located on main level. Main level features den/mud room area. 2nd floor boasts 2 nice sized bedrooms w/ walk in closets, full bath & huge loft area w/ vaulted ceiling & skylights. Large 2 car attached garage w/ pull down steps for addl storage. Large basement w/ high ceilings ready for your finishing. Addl storage area w/ double garage door doubles as work shop & storage area. MORE PICTURES UP SHORTLY.